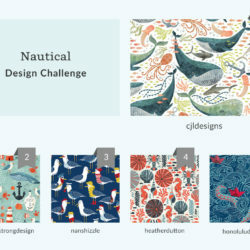 If you’ve been keeping up with the Spoonflower community, you know that in April we launched our brand new Monthly Design Challenges and our weekly contests got a little makeover. In an effort to listen to our community and constantly improve, we are changing up the structure of our weekly challenges. How it works: To “enter,” you are no longer required to post designs on social media with our specific hashtag. 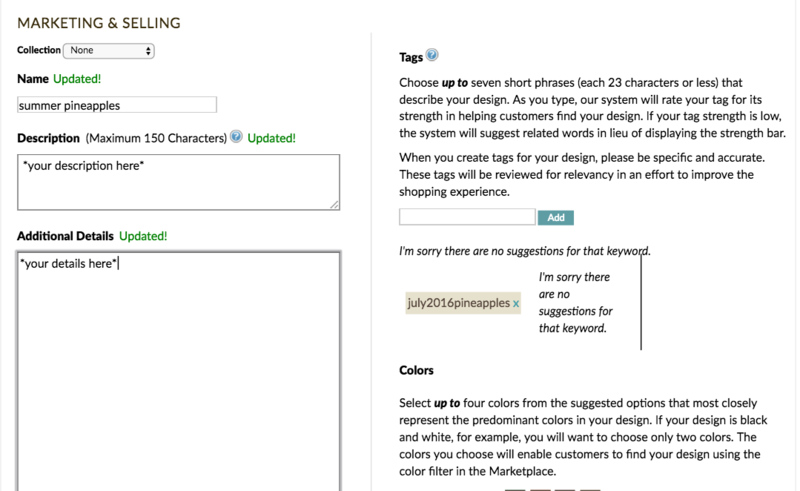 You’ll simply upload your design to Spoonflower, make it “public” and add in that week’s specific tag. Each week will have its own special tag, which is how participating designs will be found on Spoonflower. We still encourage sharing your designs on social media, as this will help you gain exposure and feedback for your designs. However, the key difference is that this is no longer a requirement. 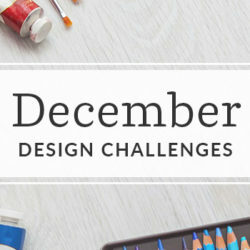 We heard your feedback that it was difficult to find the designs submitted by your fellow designers across all social platforms, so we’re hoping this new format helps with that, and also brings more favorites and comments back to your designs on Spoonflower, helping your design’s chances of getting sold (woot!). Will there be voting? There will still not be voting happening on the site, however — we will now be emailing our entire community each week with a link to view all of the weekly prompt submissions, driving more traffic to your designs. We’ll also continue to re-share as many entries as we can via our social media platforms. June 27th – July 3: Summer Pineapples | Spoonflower Tag: July2016Pineapples. Usher in the first week of July with festive pineapples. Everyone’s favorite tropical fruit (and arguably, the prettiest!). July 4th – July 10th: Marbled | Spoonflower Tag: July2016Marbled. This metamorphic rockstar (sorry, we had to!) is having a real moment right now. We want to see your twist on marble with an original surface pattern showcasing this gleaming geologic stunner. July 11th – July 17th: Tropical Cactus Flower | Spoonflower Tag: July2016Cactus. Something about cactus flowers just transports us right to our favorite sandy beach destination. It’s no surprise that this is one of the most popularly searched terms on our site! How will you interpret this dreamy theme? July 18th – July 24th: Vintage Flamingo | Spoonflower Tag: July2016Flamingo. 1950’s lawn flamingos, anyone? July 25th – July 31st: Unicorns vs. Mermaids | Spoonflower Tag: July2016UnicornMermaid. Both adorable, both mythological-beings gracing different realms of the universe. Which mystic creature will reign supreme in your design? Two winners from each month are randomly chosen to receive prizes. Our June & May winners will receive $25 each in Spoondollar credit, plus a bonus gift from Fiskars. June’s winners: Aline Pellegrini and Karisa Marley. May’s winners: Rubydoor and Kellyparkersmith. Back in May Spoonflower had said the weekly entries might win prizes, but I have seen no announcement of anyone winning anything for the weekly design ‘challenge’. Will this updated version actually award any prizes? *quoted from the entry linked at the beginning of this post* Will there be prizes? At the end of each month, participants who use the hashtag #SFWeeklyDesign will be eligible to receive prizes. 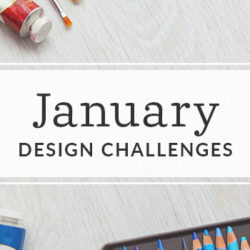 Prizes could range from free design books and tools, Creative Cloud subscriptions, Spoonflower credit (or credit for one of our sister brands, Sprout Patterns and Roostery) to free fabric, etc! Great question! This Monday (June 27th) we will be pulling 4 winners (2 for May, 2 for June) randomly from participating hashtagged designs. Winners will each receive $25.00 in Spoonflower credit, as well as goodies from Fiskars. We love your suggestion of a Staff Favorite prize! Curious though who “staff” would be if Spoonflower employees theoretically aren’t eligible? The Staff would be the judges, not the competitors. I\’ve seen it in quilting contests sponsored by quilting catalogs- there could be prizes for different categories, and one prize would be a \’Judge\’s Favorite\’ or \’Judges\’s Choice\’ which could be awarded for any reason in the Judge\’s opinion- because it met the theme best, because it used the theme in an unusual way, because the Judge felt the quilter had put a lot of thought and effort into it, because it amused the Judge, because it used techniques that went beyond the usual, even because it happened to strike a personal note with the judge. Will you be announcing the 4 winners from the June 27th drawing? Hey Maria! June’s winners are Aline Pellegrini and Karisa Marley. 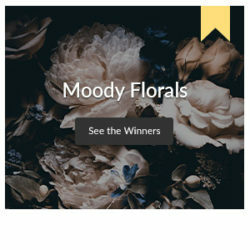 May’s winners: Rubydoor and Kellyparkersmith. Congrats, ladies! I am glad for the change because I am not on many of the share sites. I am much more likely to do a challenge that will be posted this way. Thank you! Thanks for your feedback, Denise! We’re so very happy to hear that. Yippee!!! Thanks for listening!!!! I have really missed being able to easily see what everyone creates! This does make it easier for designs to be found. I’ve not been keeping on top of the design prompts at all so far, but at least I have a pineapple design that I can tag and it may get more sales as a result. Hey Magenta! In the true spirit of the contests, we do hope that you’ll feel inspired to create *new* designs. That’s really the entire goal and intent behind the weekly prompts, to give designers the motivation to keep creating and stay inspired. Yay! thank you for listening! Since I’m not on much social media, I’m super-glad for this change. And I love the tag system for entries, so that we can see all the prompt entries together in one place (and the customers can too!) I think that will build community and help us all see each others’ work. Thanks for sharing your excitement, Kelly! We’re really happy you feel that way! As an aside – The header for this post with the dinosaurs and flowers – is it an available fabric? I love it 🙂 A version with Magnolias as opposed to roses would be even better. Thanks so much for taking the time to share your feedback with us. Please trust that we are listening and working hard to make weekly prompts fun and inspiring, we’re constantly making improvements and there’s still a lot more up our sleeve so stay tuned! Seesawboomerang, I wanted to let you know personally that our engineers have just fixed the inability to comment on mobile / ipad devices, so it should be working now! Hooray! Thanks so much for all of your patience, and for participating in our weekly prompts. Please trust that we are constantly improving and have more up our sleeve still yet to come! Hello! Can I tag multiple designs or just one? Thanks. Multiples are fine for the weekly prompts! D’oh! We’ve just updated the tag to July2016UnicornMermaid — thanks for participating!